Easter decorations – cute and stylish. Spring has sprung & the bunnies are ready to celebrate! Hop to it, download cute Easter Bunny garland! You can also find the Easter Bunny garland templates as part of Happythought’s Easter Bunny party pack. Get ready to celebrate with Happythought’s double sided Easter Bunny garland (or bunting as we call it here in Blighty). Super cute and super easy to make too! Just follow the simple instructions included with your template. Print and cut out each bunny, folding it’s bunny ears over as shown. Then hang each bunny on a length of ribbon. You can make as many garlands as you like and hang them in your home, in your garden, in your work space or in a classroom or homeschool setting. Attach sticks or straws to the back of your bunnies (10 of each color) and hide throughout your garden or home. Divide your guests into 3 teams and allocate a color of bunny – orange, blue or yellow – to each team. Once all the Easter bunnies have been found they can be exchanged for chocolate eggs! Bunny count – Hang Ten! Hang 3 lengths of ribbon and form 3 teams. Print, cut out and fold the ears of 10 (or more depending on the number of players) of each color of bunny and allocate a color to each team. The first team to hang all their bunnies by the ears are the winners! 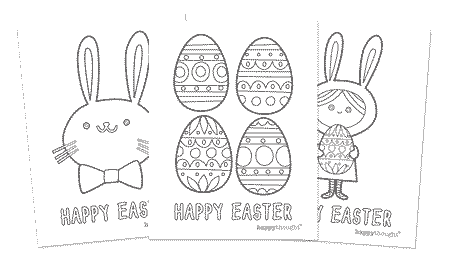 Print and color our fun Easter coloring in pages! Yummy eggs to color in, a cute girl in a bunny suit holding a great big easter egg and lastly the handsome Mr Bunny. Download Easter bunny PDF Pages. If you tried and liked our Easter bunny garland, you might like our fabulous ‘Easter Bunny party kit’ – $5 – packed with great printables for any bunny.